While we were in Washingston state for the wedding of my niece Danielle, John and I talked the Cascade Pass Trail in North Cascades National Park. I’ve been sitting on these photos for a couple months with the intention of writing something about them that was as transcendant as the hike. We’re back from a vacation through western Manitoba and Saskatchewan in Canada, and western North and South Dakota. It was a very edifying trip. I have a lot to process and learn more about– Lakota history and philosophy, the North Dakota oil boom, mountain pine beetle. I’ll be writing about all of this over the next few weeks. But first, to get the ball rolling, pretty pictures! This was a sweet memorial community garden in a tiny, tiny town called Manson at the very western edge of Manitoba. It’s near where Juniper grew up, in McAuley, MB. In fact, these are the people who bought his family’s farm. I love all the gnomes in the garden, and the island bed approach to layout. Very 1950s working class English. The garden features lots of retired farm equipment. An archipelago of island garden beds. These are the people who bought Juniper’s family’s farm. Old one-room schoolhouse gable front. 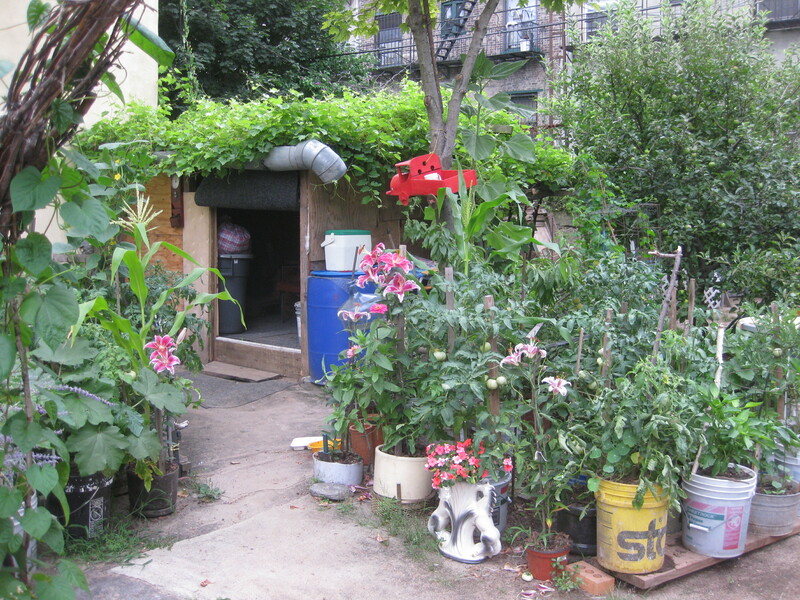 Last night was the New York City Community Garden Coalition’s monthly meeting. Word of disclosure: I’m on the board of directors. 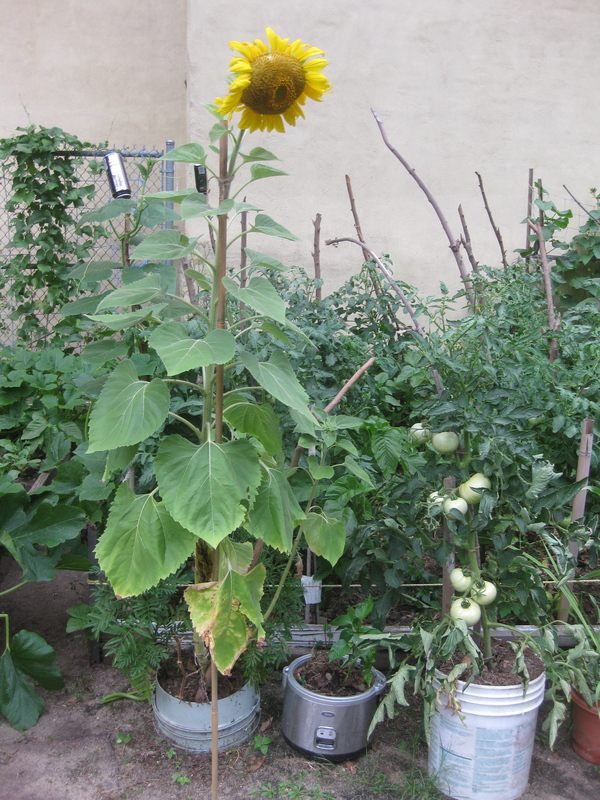 In the summer, we hold them outside at community gardens in different parts of the city. Last month the meeting was at Papa and Mama John’s Historical Garden in East New York, Brooklyn. Next month it will be at Brook Park in the South Bronx. But last night it was at the Carrie McCracken Garden in West Harlem. As always, this was a bustling meeting, with lots of news, energy, and good ideas for garden activism. And West Harlem has changed so much. It’s been a while since I had been there, and I was amazed by the bustling, high-end restaurants and the fancy apartment buildings. To be sure, all that clearly co-exists with persistent poverty and unemployment. The Carrie McCracken gardeners reported last night that they succeeded in transferring the garden to the Parks Department’s land portfolio only last fall, and that developers were lobbying hard to get their clutches on it. With the in-your-face gentrification, it’s clear why. It’s a lovely garden, that is lovingly maintained. Congratulations, Carrie McCracken Community Gardeners. I love Boston Ivy. It’s beautiful; birds like to nest in it and eat the berries; and it actually protects the wall, adhering with suction cups, not burrowing roots. The garden had many wonderful arrangements of potted plants. This was my favorite arrangement of potted plants. I love the gleaming yellows and yellow-greens. Ray Figueroa chaired the meeting last night. The Farmer Field School had a workshop last night at Hart to Hart Community Garden, which is on Hart Street in Bedford-Stuyvesant. The gardeners here are clearly focussed on growing food. It’s a lovely garden, with a strong, diverse membership. Always nice to see a beehive. Planning for the seasons workshop sheets. Well-trained tomatoes. I wish I had this gardener’s discipline. Canna lily – like a Georgia O’Keefe painting! The Phoenix Community Garden is participating in the Farmers Field School cover crop collaborative research project, led by the amazing Megan Gregory. Megan, Marcia, Kelly and I gathered in the brutal July sun today to begin marking which beds will grow cover crops, and what they will be. Megan will be conducting before and after soil tests. I look forward to sharing the results here. I love the details of the hanging toy truck, the impatiens in the ceramic planter, and the huge lilies (thank you pigeons for your manure). 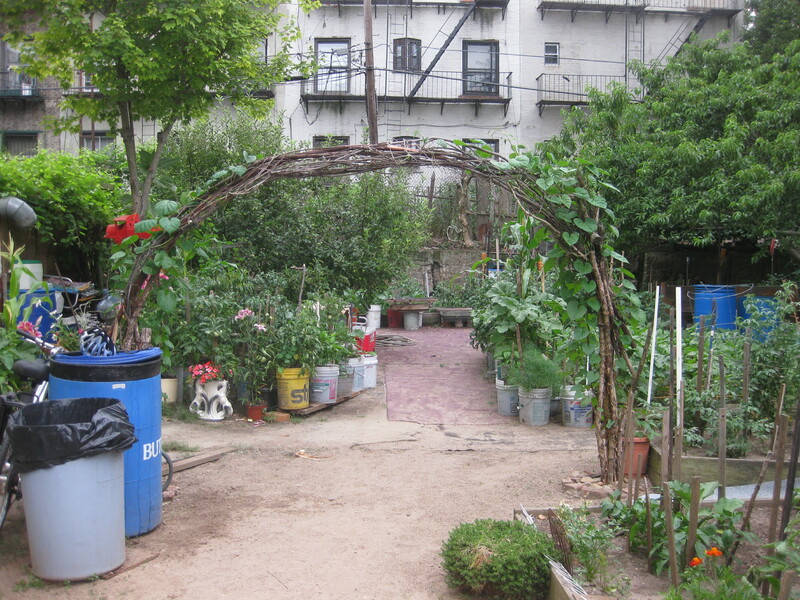 The Granite Street Block Association Community Garden is a block from my house — I have a plot in it. The guys who are the main gardeners all work construction. They salvage compound buckets from work, plant them, and assemble amazing gardens. Here are a few highlights — I took these pictures two days ago. Hanifa made this out of woven branches. I finished up at North Star Fund last week. The last few months have been jam-packed, on many levels. After catching up on my sleep and a camping trip to Vermont, I’m ready to start new projects. And blogging more. Please stay tuned.